Two priests were among at least 18 people killed in a dawn attack on a church in central Nigeria, police said Tuesday, in violence condemned by President Muhammadu Buhari as “satanic”. Nigeria’s President Muhammadu Buhari described the violence as “satanic” in a statement. The conflict is now more deadly than the Boko Haram jihadist insurgency that has ravaged Nigeria’s northeast and is becoming a key issue in the upcoming 2019 presidential polls. Benue state lies in Nigeria’s so-called Middle Belt that separates the predominantly Muslim north from the largely Christian south. The area has long been a hotbed of ethnic, sectarian and religious tensions between indigenous farming communities, who are mainly Christian and the nomadic cattle herders, who are Muslim. The clashes over land have escalated into a rift that has deepened along nominally religious lines. President Buhari, who is seeking a second term, has been under pressure to end the violence and ordered in military reinforcements, but the killings continue in the absence of a strong police force and efficient judicial system. “People are being killed regularly and nothing is being done in terms of bringing perpetrators to book,” Idayat Hassan, director of the Centre for Democracy and Development West Africa, stated. Fr. Tyolaha had been displaced by herdsmen in his own parish and he went to take refuge in Fr. Gor’s parish. More than any other institution in Nigeria, the Catholic Church has been in the vanguard of calling our political leaders to stand up to their responsibility of protecting lives and property. Recently the Bishops called again on President Buhari to give close attention to Nigeria’s degrading security situation. In his Easter message, Bishop Kukah called on the President and his security advisers to wake up to the daily orgies of blood in the nation. 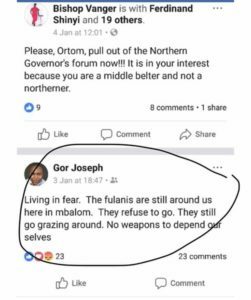 The blog site also published a message which Fr Joseph Gor had post on Facebook in early January 2018 which implied fear and intimidation by the Fulani herdsmen. 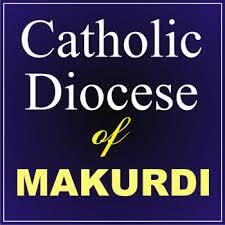 Fr Michael McCabe SMA asks readers to remember the people of the Diocese Makurdi, Nigeria, in their prayers. There are 14 Irish SMA missionaries currently working in Nigeria.